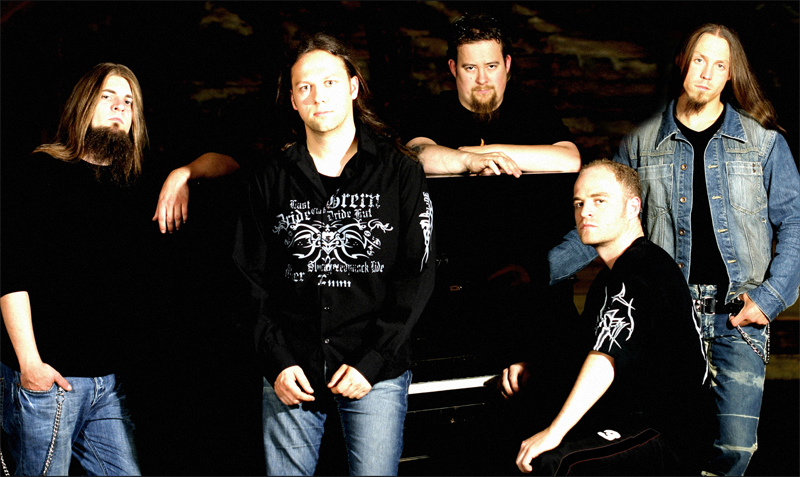 Welcome to the home of Jester's Funeral, a power metal band from Germany that existed from 1996 to 2006. On this page you'll find the complete history of the band and the possibility to download all songs the band ever recorded. STEFAN SCHMIDT (guitar, vocals) gets to know HEIKO HÖHN (guitar, vocals), the brother of BJÖRN HÖHN, who played bass in Stefan's band GLOOM in 1994 (together with INGO STERZINGER). Heiko and Stefan write some hard rock songs together and have two rehearsals together with HOLGER WIES (bass) and STEFAN SPERLING (drums), who are friends of Heiko. The working title of that band is JESTER. Heiko and Stefan soon notice that they want to write songs in a more heavy style, like the songs in Stefan's project FENAOR's LIGHT, featuring metal songs in the style of GAMMA RAY's LAND OF THE FREE. After the split of their former bands GLOOM and STAY, Heiko and Stefan write two songs together (Jester's Funeral and Bolysseus' Cult). They record these two songs as a demo on Stefan's 4-track-recorder with drum-computer. The search for band-members ends up in Holger Wies and BASTIAN EMIG, who knows Stefan from the school yard. In May the band decides to run under JESTER'S FUNERAL and starts songwriting and rehearsals. The style is heavy rock between Metallica's Black Album, older Iron Maiden and some influences of Blind Guardian concerning lyrics and fantasy feeling. On June 5th 1996 Jester's Funeral plays the first gig organized by friends as an free-entry-open-air in front of 300 people. The five songs played are "jester's funeral", "bolysseus' cult", "make my day", "carpe diem" and "time". In August the band records the first demo tape together with RAPHAEL ZÜRN, the drummer of Stefan's former band Gloom, who works as a live engineer at that time. The demo WALPURGISNIGHT contains 8 Songs and is released in 1996, sold for 4 DM. The band continues playing gigs in and around Bingen, Germany. New songs are written. The band records the second Demo DAYS OF MEDIEVAL, containing 8 songs. The style is a bit more alternative, sounding more hard rock than metal and introducing a progressive touch. Heiko and Stefan are still sharing lead vocals. It features a cover artwork of CHRISTIAN WEBER, who is a friend of the band at that time. Stefan sends the demo to Frank Albrecht of RockHard and to ANDREAS SCHÖWE of MetalHammer. In the meantime, Stefan writes some songs in Samael-Style together with his schoolmates NIC KOBOLD (guitar) and DENNIS DEFLAND (vocals). They run as ELIXIR and record a two song demo with lots of symphonic keyboards and double-bass drum-computer. They present two songs to the public as "Opener" of a regular JF-Gig in Bingen. The crowd likes the modern approach and the other bandmembers of JF are impressed as well. The band decides to take Nic as a 5th bandmember, playing Keyboards and Rhythm Guitar. There is a rehearsal session with Dennis Defland as well, but the band wants to keep a melodic touch and decides not to work together with Dennis who is a great shouter, but not the best singer. Stefan is introduced as the lead singer from that point in time. Heiko plays the lead guitar. Together with Nic, the band sounds much deeper, heavier and more modern. At the End of summer, the 2nd Demo is handed over to SÖNKE LAU, singer of UNREST and member of BLACK ARROW PRODUCTIONS, a hard rock and A.O.R. orientated label. The band goes to Osterholz-Scharmbeck, a village near Bremen and meets Sönke and JÖRG-RAINER-FRIEDE, owner of TTS Studios. After one week of discussion, the band decides to sign a production deal with Black Arrow. The band writes new songs for the first album and plays some live gigs. The album is recorded in August 1998 in TTS Studios by Jörg-Rainer Friede. The recordings take 4 weeks. 1 week for drum recording, 2 weeks for bass, guitar, keyboards and vocals and 7 days for mixing. The sound is more progressiv. The band records some of the songs in a quite slow manner, so they don't sound as heavy as the did in the rehearsal room. Nevertheless the band is stunned by their first studio recording. One song, called 'Labyrinth' is recorded but doesn't make it on the album, because producer Jörg-Rainer Friede doesn't think it's a good one. Because of the fact that the album was planned to be named after that song, and because of the cover artwork by Christian Weber was already done, the band decides to call the album LABYRINTH, although the title song didn't make it on the album. Jester's Funeral have their release party in December, playing in front of 400 people in Bingen. The gig is interupted by a crash of Bastian's bass drum pedal, so Stefan does a solo performance of Blind Guardian's "The Bard's Song". The album is released via POINT MUSIC in Europe. Because of the fact that only 2000 units are produced, it's not easy to buy the album in regular record shops. The band gets a very good review of Andreas Schöwe in Metal Hammer and (due to the young age of the members) some good natured but not too entuthiastic reviews from other online- and print mags. The band sells all 1500 copies in the next 20 months. No reprint is done. In 1999 Jester's Funeral plays two gigs together with TOTAL DISORDER, a band from Ingelheim, a small village near Bingen. They feature DANIEL WICKE on bass guitar and GERRIT WOLF on lead guitar, a very skilled young guitarist, writing modern progressive metal songs in the style of DREAM THEATER's 'Awake'. By his stile of playing Stefan is inspired to check out the use of 7-string guitars and orders his first 7-string-Ibanez in a local guitar shop. The band plays more gigs and enter even bigger stages. In September they play the Summermania Festival at Airfield Frankfurt Hahn. BLIND GUARDIAN cancel their appearance due to an acute hearing loss of singer HANSI KÜRSCH - this won't be the last time that Jester's Funeral miss the chance to get to know their idols very tersely. The day after the Summermania Festival Bastian and Stefan are off to leave again to Osterholz-Scharmbeck to record the second album. During the drum-recordings of the first song MAKE MY DAY (a new arranged remake of the song on the first demo), producer Jörg-Rainer Friede gets a heart attack on the toilet and is brought to hospital by Bastian. The recordings are quit after the 2nd day. The band "benfits" of the break writing three new songs: JESTER's EMPIRE, TIMEBOMB and ASTROCRY. In February the recordings finally take place in Osterholz-Scharmbeck together with a recovered and very thankful Jörg Rainer Friede. The band puts a lot of time in orchestral keyboard arrangements and background choirs and sound much heavier due to Stefan's more aggresive style of singing and the deep tuned 7-string-sound. 'Make my day' is not recorded again because of the "bad history" of the songs and because of the three new songs. During the recordings it becomes more and more clear, that Heiko loses the relationship to the new style of Jester's Funeral, somewhere between Metallica and Blind Guardian with a very modern sound. Stefan plays most of the solos and all rhythm guitars. After the recordings Heiko and the band decide to split. Heiko is replaced by GERRIT WOLF. In late 2000, QUICK SILVER LIGHT is released, again with a cover artwork of Christian Weber. It gets stunning review from many magazines and fanzines all over the world and airplay in some metal shows. The band does tons of interviews and do a massive internet promotion. The song TRAVELLER becomes the band hymn and is played on many gigs. The band sells about 5000 copies of Quick Silver Light between 2000 and 2002. At the end of 2000 Bastian and Stefan join Sönke's Band UNREST and plan to support them on tour. They don't play on the album BLODDY VOODO NIGHT, although they are featured on the official bandphoto. Finally it will turn out that they never play a single Unrest-gig due to the split of the band in 2001. Nic joins the Death Metal Band SOLICITUDE where he plays rhythm guitar. The band plays some more gigs, writes new songs and faces some serious changes. Black Arrow is taken over by Jörg-Rainer Friede and is renamed to TTS Media Music. Sönke Lau is still the A&R. Stefan and Gerrit are announced as official ENGL-Endorsers, Basti starts an endorsement with UFIP-Cymbals. In summer Holger decides to leave the band to have more time for his family. He is replaced by MARTEN MÜLLER. The band decides to keep up the tempo of the last two years and reenters Jörg's Studio in September 2001. Stefan plays the Bass Guitar because Marten has joined JF one week before the recordings. The recordings go well, the band got very professional in the last years. Unfortunately the band misses the chance to continue the very succesful style of QUICK SILVER LIGHT and get more progressive again. Nevertheless the sound is heavier and more mature than ever before. The lyrics of the Song CITY OF GLASS are written by JAN D. KUCHARZEWSKI who got to know the band on a gig in Cologne. Stefan does guest vocals on the album LOST of the labelmates FADING STARLIGHT, featuring INGA SCHARF on vocals. In 2001 the band starts to leave their old rehearsal room in the basement of Bastian's father's house and are building a new rehearsal room with a connected project studio in Bingen. 2002 is a bad year for Jester's Funeral. Having changed to TTS Media Music, the label of JF is very busy with recording many bands (paying for the recordings!) in shortest time. The release of the third album SHIFTING SKYWARDS is rescheduled again and again. The great cover artwork (again by Christian Weber) is planned to be covered with a huge "SURROUND DVD INCLUDED" sticker. The band intervenes and is suddenly caught in a bizarre fight with Jörg Rainer Friede. Jörg is losing his reputation by ripping one band after another, rescheduling and refusing release dates. The dispute turns out in an order to stay away from Jörg's Studio for Stefan. The Surround-DVD is canceled and the release is rescheduled to 2003. Furthermore the band applies for the support slot of Blind Guardian's a night at the opera tour but is rejected. As they will get to know years later, they had a serious chance to be taken until FREEDOM CALL applied for the tour. The positive thing in 2002 is the completion of the Jester's Funeral Rehearsal Room and a handful of very powerful gigs. To deflect from the problems, Bastian and Stefan join THE RAZORBLADES, an instrumental surf rock band founded by Stefan's brother MARTIN SCHMIDT. Shifting:Skyward is finally released in march. The band is nerved by the rescheduling and has to promote an album recorded nearly two years ago. Therefore the interest and feedback of magazines is not as big as it was with QuickSilverLight. Due to the progessive touch of the album many true metal fans are not satisfied with the style of shifting skywards. Gerrit leaves the band to focus on BEYOND SURFACE, a side-project he founded in 2002 together with Marten. BEYOND SURFACE turns out to be very succesful, winning a Metal Hammer contest together with PERSUADER, band of later SAVAGE CIRCUS singer JENS CARLSSON. Marten takes over lead guitars and DANIEL WICKE is the new bass player. The band plays only 4 gigs in that year, Bastian and Stefan are on the road with THE RAZORBLADES. The band works on new songs together with JAN D. KUCHARZEWSKI writing all lyrics. He is contact with JOHN SHIRLEY, an american author and screenwriter, known for his CYBERPUNK-Novels and his screenwriting for THE CROW with BRANDON LEE. The band evolves the concept to write songs based on Shirley's Short Stories. The atmosphere in the band gets more and more tensed due to the dissapointments with the record company. The band loses weeks and months in endless rehearsal room discussions concerning songwriting, singing style, sound design and everything else one can discuss about. Nevertheless the band manages to start recordings on the album. This time they record everything on their own, supported by sound engineer JAN SAUERESSIG. The band plays 7 gigs in 2004, two of them together with SYNASTHASIA from Duisburg, getting to know drummer DENNIS STRILLINGER and lead singer DENNIS P. SCHUNKE. Nic leaves SOLICITUDE, Daniel joins THE RAZORBLADES. The discussions in the band get more and more intense, climax is the short band quitting of Bastian. He can be convinced to continue, and the fourth JF-Album "FRAGMENTS OF AN EXPLODED HEART" is finished. The band tries to look for a new record company but is very exhausted and only plays two gigs in 2005, the last one on May 13th, together with FADING STARLIGHT. Jester's Funeral cannot find a new record label for their fourth album. The mixing of the album is finished and is available for free download on the JF website for about 4 weeks. The band finally decides to split. Stefan leaves THE RAZORBLADES and starts VAN CANTO together with DENNIS STRILLINGER. Bastian leaves THE RAZORBLADES and takes a one year trip to China. Stefan is part of VAN CANTO together with Bastian, Ingo Sterzinger (Stefan's bandmate from GLOOM), Inga Scharf of FADING STARLIGHT, Dennis Schunke of SYNASTHASIA and Ross Thompson. Daniel is still playing with THE RAZORBLADES and is part of IN LEGEND. Nic hasn't touched a guitar after May 13th 2005. Gerrit is envolved in his new project JOVIAN SPIN, together with Marten. Heiko and Holger are playing together in a classic rock band.